I love sentimental jewelry. And I have a daughter that loves to collect little things, like rocks and sea shells (and sticks and leaves and flowers). Whenever we go to the park or to the beach, I end up with a pocket full of whatever interesting little thing she picks up. So when it came time to start thinking about Mother’s Day gifts for grandma, I thought I would try to make something out of the things she has acquired along our many outings. 1) Wash your pebble off (I used dish soap and an old toothbrush) to remove any dirt or grime that may be on it. Cut a piece of craft wire about 12-24 inches long depending on the size of your stone. 2) Make a wrapped loop with one end of your wire. 3) Bend the wire 90 degrees about a quarter inch down from your loop. This will be the height of the wrapped cap on the stone. 4) Holding the wire snugly to your pebble, wrap the wire around until you get your desired look. 5) The wire cap will not stay attached to the stone. Separate them and set the cap aside. 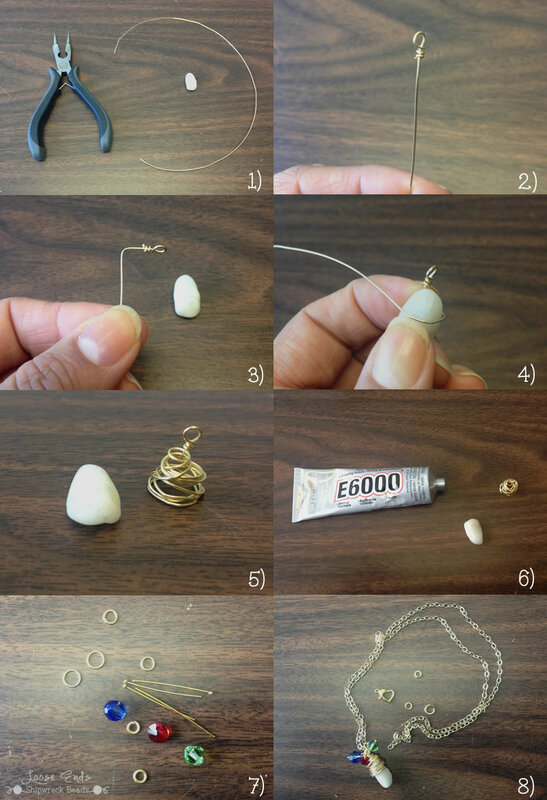 6) Apply a generous amount of glue to the pebble. Place the cap back on the top of the pebble and hold it in place until the glue has dried enough to keep the cap in place. I recommend allowing the glue to dry for at least an hour (24hrs is ideal) before handling the pendant. 8) I wanted a longer necklace so I used about 26 inches of chain. Add your clasp and you are done! 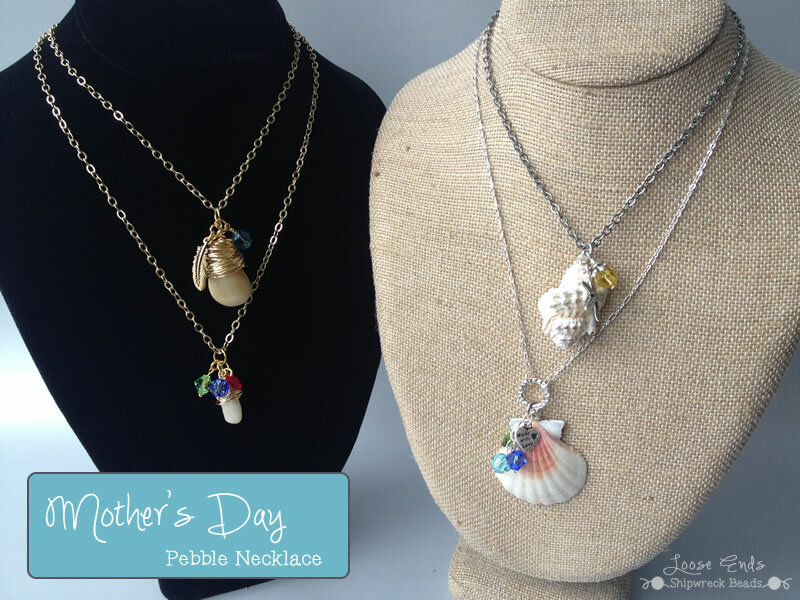 Variations: If you would rather use a sea shell than a pebble, glue a small bail to the back for an instant pendant! You can also add a charm to the pendant in addition to the birthstones for an even more personal touch! I hope you enjoyed this little tutorial today. 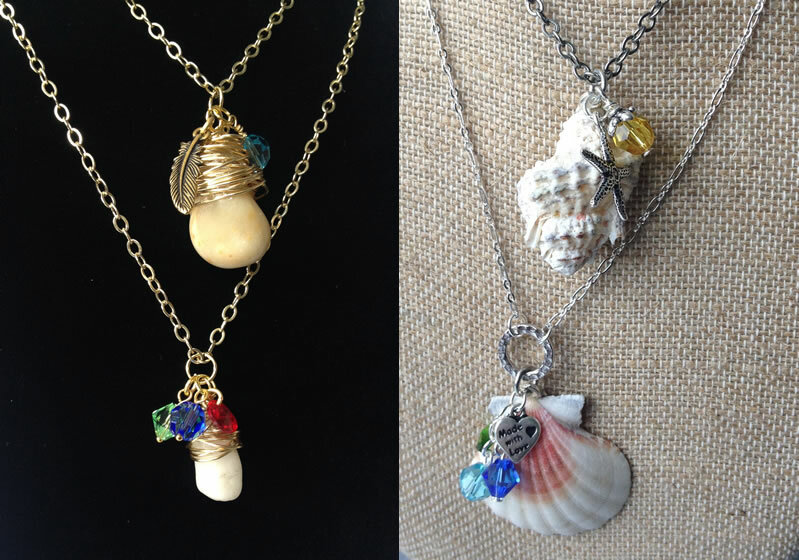 Please share with us on Facebook, Twitter or Instagram using hashtag #shipwreckbeads! I would love to see your take on this necklace. Reblogged this on Jewelry and Purses 2020. Hi, Kelsy! Thanks so much for visiting my blog and leaving such a sweet comment! I looove your version of the wrapped beach stones – usually they look kinda blah, but your tornado-style wrap is just gorgeous. Gonna try it! What a great idea! Nothing better than a personalized gift made with love! I love it! I will make it!